The below calendar is a list of events at Agua Caliente Park. For events at all Pima County Natural Resources Parks and Recreation, click on the below Link than select Calendar on the right side (use browser back button when complete to return to the FOAC calendar). Natural Resources, Parks & Recreation also has an online registration system. The system will allow you to register for leisure classes, tours, bird walks, nature hikes and other outdoor activities. You can also reserve a ramada for your next event. You will need to create an account to use it. Active Net charges a convenience fee of $2.50 per transaction + 3 percent of the cost. You can make a reservation by phone (520-724-5375) or in person to avoid the fees. Another cost saving option is available with the purchase of a $50 annual membership pass for free or reduced-rate registration for Tours & Outdoor Activities. To Register, use the below link and select “Register Now” (use browser back button when complete to return to the FOAC calendar). 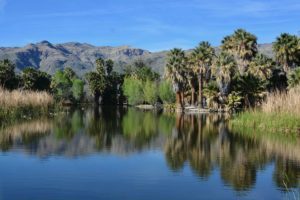 Beginning May 6, 2019, events will not take place at Agua Caliente Park due to the Construction and Restoration of the Main Pond at the Park. However, the park will remain open until the Main Pond is drained and the Restoration project begins usage of heavy equipment. At that time, the entire park will be closed until the restoration is completed (estimate 4-6 weeks from initial closure). The park will re-open and events will resume after the Main Pond Restoration is completed (probably in the Fall of 2019 after Monsoon).